Did you know that millions of veterans and their families are eligible for Veterans Benefits but do not receive them? Why? Many reasons, including confusion about what benefits are available, who is eligible for them, and the complicated application and approval process. The Aid and Attendance pension program provides eligible veterans with a number of benefits. First and foremost, it allows a veteran or widowed spouse to pay anyone, including his or her child, for home care. It can also be used to help offset the cost of in-home professional care, assisted living fees, nursing care, insurance premiums, prescription drugs, co-pays and more. Bottom line? The Aid and Attendance pension program can allow a veteran or widowed spouse to pay for care, whether at home or in an assisted living community, preserve assets, and stay out of a nursing home for as long as possible. 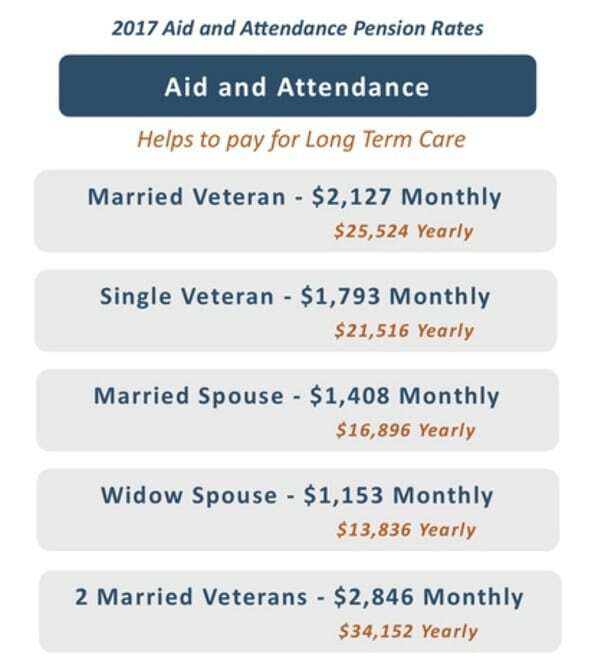 It pays up to $2,127 for the eligible veteran and over $1,153 to the eligible spouse to assist with medical expenses and the cost of long-term care. If you think you may be eligible for Veterans Benefits, please contact us to learn how we can help. We can quickly determine if you are eligible and guide you through the process efficiently and compassionately. We were extremely happy with the clear and thorough job done by NJ Elder Care Law Center. They clarified many complex estate planning issues for us. - Karen and Robert I. My family needed a knowledgeable elder care lawyer to determine the best options for my aging and ailing parents. NJ Elder Care Law Center was recommended to us and they did an outstanding job in reviewing our options, quickly reallocating my parents’ assets, and qualifying them for additional benefits. My father is a WWII veteran and Eric also identified additional Veteran’s benefits that could further help my family. Most importantly, they were very sensitive, patient, and responsive to my entire family. They made sure my mom understood every step of the process. It was a pleasure to work with NJ Elder Care Law Center.